Welcome once again to Ian and Blake’s annual Halloween series about a genre that does what few others can. Here’s this year’s final spooky top-five! Before you dive in, make sure you don’t miss last week’s installment on the best introductions to horror for kids. This entry is a spring-loaded little yarn from M.R. James, the early 20th century master of the English ghost story, and follows Parkins, an antiquary investigating the ruin of a Templar preceptory. 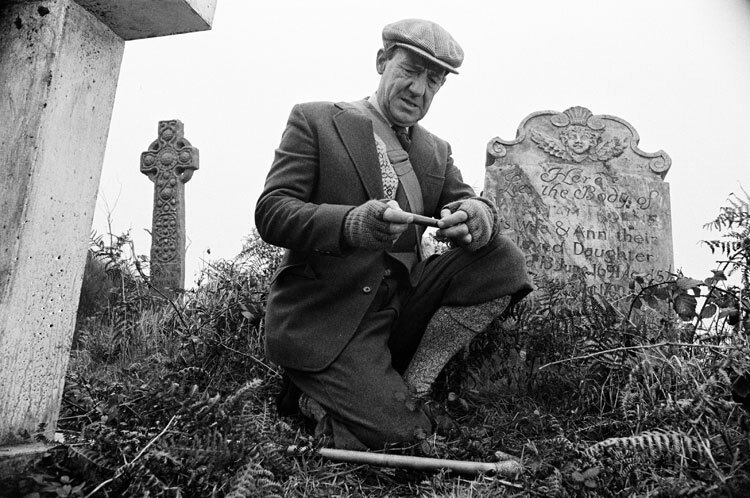 While searching through the remains he discovers a whistle inscribed with Latin and translates the first of its two phrases: “Who is it that comes.” Unfortunately he was unable to decipher its second phrase: “Thief, blow, weep.” He gives it a blow and unwittingly invites a nameless terror to pursue him and the whistle. The plot isn’t complex but its simplicity mirrors the linearity of the story’s curse and invites reflection upon the many “unforeseen consequences” of our own actions we wish we could undo. This tale documents the narrator’s spiral into–what? Insanity? Or (worse) awareness? Our protagonist is a telemarketer who is experiencing the same type of soul-numbing boredom David Foster Wallace chronicled in The Pale King. “Dial Tone,” however, contemplates the drudgery and sees no redemptive edge working within it for good; instead, we begin to discern an insidious agency within that listlessness and misery that is robbing him of his subjectivity and reducing him to minimally alive, embodied entropy. “Dial Tone” asks us what inhuman sources we seek solace and consolation in and shows us the outcome of that dehumanization, and its horror lies in the casualness of the narrator’s descent into monstrosity. “Sticks” is a lean foray into cosmic horror from Karl Edward Wagner. In “Sticks,” an illustrator for 40s pulp horror magazines discovers an abandoned house in the backwoods of upstate New York. Surrounding it, littering the grounds and the interior, are eerily arranged stick latticeworks. He sketches everything he sees and begins to discern repeated patterns to the stick figures. Against his better judgment he explores the basement and discovers a megalithic foundation much older than the house he initially entered into. The terrifying encounter he then has irrevocably impacts his vision of the world for the rest of his life and leads to a shift in his artwork that pushes him to the periphery of his professional circle. Years pass before a researcher hears of his discovery and pleads for more information, believing it may be a link to a prehistoric cult who left monuments scattered throughout New England millennia prior, monuments later cultists, abandoning the Puritanism of the colonies, appropriated in their worship of the Old Ones. “Sticks” succeeds because it slots a bizarre happenstance of an everyday sort (discovering the sticks and the abandoned house) into the Cthulhu mythos pioneered by H.P. Lovecraft; this move beckons us to view the incidental mundane moments of our lives as aspects of a gigantic, terrifying story of which we are only incidental players, negligible participants in comparison to the powers and principalities plotting their ascendance at invisible right angles to our own existence. This one is the granddaddy of so many eldritch tales of terror, many of them by the horror writers you know and love who have tried a hand at an entry in this universe. 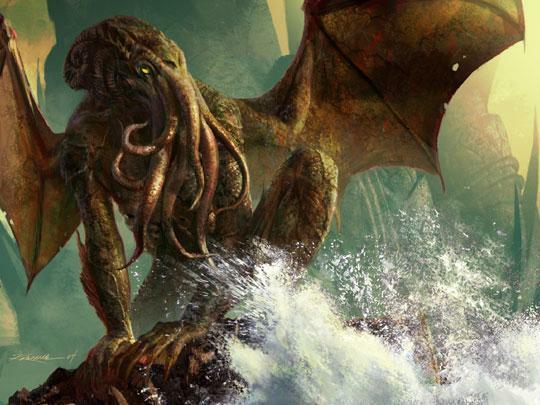 “The Call of Cthulhu” initiated this shared mythos and was itself an appropriation of elements in a tradition beginning with Ambrose Bierce (“An Inhabitant of Carcosa”) and Robert W. Chambers (The King in Yellow) [let the viewer of True Detective understand], but one that innovated that fictional inheritance with a bleak, misanthropic vision of an indifferent cosmos populated with ancient horrors that dwarf humanity in power and significance. “The Call of Cthulhu” is masterful not only for its delivery of monstrous frights but particularly for the way it binds together seemingly disparate incidents into a cohesive, terrifying whole, challenging the rationalist paradigm of Lovecraft’s era with its assured sense of human superiority and the myth of progress. It puts flesh on the story’s prologue which asserts that the most merciful thing for humans is the inability of the mind to correlate its contents, for if all the dissociated knowledge we have ever accumulated were to be seen as the entirety they really are, we would go mad with the horror or sink back into barbarism. “The Call of Cthulhu” relies less on fright and more upon the existential burden of accidentally uncovering the reality of things that should not be and yet are and delivers a truly unique brand of horror in the process. “The Room in the Tower” is an exercise in tortured restraint. Have you ever been hounded by a nightmare that persistently returned night after night? This is the premise behind “The Room in the Tower,” and it is all the more interesting for the way it grapples with determinism versus free contingency. 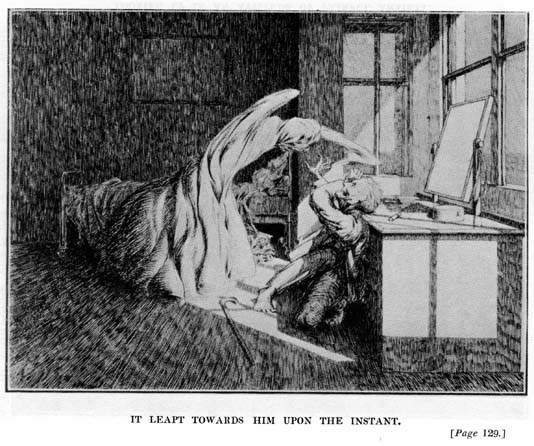 The narrator is plagued by a recurring dream in which he is visiting a friend and is suddenly told by the friend’s mother, “Jack will show you your room: I have given you the room in the tower.” The dream never discloses what is in the room awaiting him, but hearing those words and making his approach up the stairs fills him with unfathomable dread. This nightmare has haunted him and warped his fears and expectations for years, but a visit with a friend that seems to bypass the dream’s details brings him relief. All of that changes, however, when the hostess says, “Jack will show you your room: I have given you the room in the tower.” He finally must face the terror that has been biding its time for fifteen years. “The Room in the Tower,” like the parable of Death meeting the man in the market in Baghdad, depicts the inevitable outcome that becomes fixed when we try to veer away from horror. Horror is here and will have its way, but there is One who has defeated those horrors by taking their repugnance and harm upon himself and allowing them to do their worst. And that is why we can train ourselves for our encounters with those horrors and walk away alive, ready for combat because they have been disarmed by Christ and put to open shame. And that is why we can enjoy these tidbits of terror that can do no more than startle us a little and excite a fleeting flash of fear. 5. Templar ruins, a Latin-inscribed whistle, and a quick pursuer that moves oh so oddly. While I don’t particular find the conceit of this story all that terrifying, I must say that M.R. James really kills it with the finale of the disheveled bedclothes rising up out of nothing to attack the narrator. The idea that an entity could rise up out of my bed randomly actually gives me more creeps than most things. So while I probably would have shifted the circumstances of the narrative, I find the finale to be very well conceived. 4. I feel like the dread of being a telemarketer in real life might actually beat this sort of futuristic, hyper-realized version of the work. The narrator finds himself caught in strange happenings that deal directly with his dehumanization at the hands of his corporate bosses. This is the most recent selection in Ian’s list, and there are some pretty cool elements going on in the story while avoiding being too “on the nose” about its commentary. A blindsiding selection from Ian. Nicely done. 3. 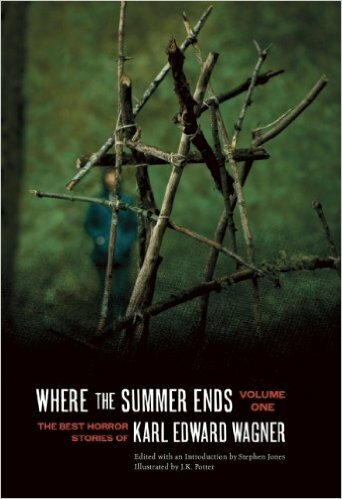 Of course Ian would pick the short story that influenced the strung-together stick statues of Blair Witch and 1st season True Detective fame. Easily the most—and, dare I say, only—frightening thing about the Blair Witch films and somehow the least frightening thing about True Detective. What I like about the conceit of this story is how the author is able to make the connection between the supposed acts and rituals of the past and the terror of the present. I find America is often too disconnected from the past because of a misguided rugged individualism. The past can and does haunt us and can often tangibly find ways to destroy us. I think it is exactly that aspect that makes this a worthy pick for this list. 2. I mean, it’s H.P. Lovecraft, the king and creator of the Cthulhu mythos. He is the master of tearing away at the horror behind man’s limitations of knowledge. Because what is beyond our knowledge is not necessarily something good or able to be comprehended. The only bad thing about this pick is, I mean really, it should be #1. 1. E.F. Benson’s “The Room in the Tower” is a nightmare version of déjà vu. The narrator dreams of visiting a house where he is consistently put in the room in the tower and has that ever evasive “feeling of dread” that marked many of the earlier horror short stories. But then he turns up at the exact house, gets put in the exact room and finally recognizes the reason for his feelings of dread about the room. It’s a fun little story, but nowhere near good enough to be placed in front of Lovecraft! Also, where’s the love for Stephen King’s short stories? I mean that’s some of his best writing! Or even better, THE YELLOW WALLPAPER, which still gives me the creeps and remains my favorite horror short story. Not a bad list overall, though. Methinks Ian has a taste for the old gods and frights more than anything. Thanks for tuning in, y’all, and HAPPY HALLOWEEN! Read more on and from Ian.